As our YoYo team and volunteers work in schools and churches, we take safeguarding very seriously. Every year we commit to evaluating our Safeguarding Policy to make sure it is up to date. This year we had our policy evaluated by thirtyone:eight (formerly CCPAS) the independent Christian safeguarding charity, who were able to help us ensure that our policy is up to the industry standards for best practice. You can view our policy here. Did you know that YoYo is a Local Mission Partner with Scripture Union? Scripture Union (SU) support us in growth, training, and through administrative assistance. They pray for us, and send out our prayer requests to thousands of followers through their ‘Connecting You’ magazine. The regional North East England and Yorkshire SU team provide us with practical on-the-ground support and training, as well as supporting us with key administrative and governance tasks. They run regional conferences and events which we greatly benefit from. For more information on SU’s other Local Mission Partners, you can click here. Did you know that our very own Executive Officer Tony Bower is a published author? Tony excels in creating and performing drama and poetry workshops in schools, and here he has published a collection of scripts, poems, prayers, and dramatic readings, all about some ground-breaking encounters with Jesus. These can be used in schools and churches, for lessons, assemblies, and services to impact and inspire. “Let's go back nearly 2,000 years, to a big city in the back-water province of Palestine. Many people back in the city of Jerusalem were about to have an encounter with a man they would never, ever forget. You can read some sample chapters and purchase Tony’s book online here. If you are interested in having Tony or the YoYo team come to your church or school please get in touch. Give to us, or get involved! YoYo is a charity, we offer our services free to schools and churches across York. We are always appreciative of your support and there are many ways you can give to us, or get involved! Finances: Although we have low overheads, we do need to watch our pennies to make sure we keep afloat! If you would like to partner with us financially we would be so grateful. We’ve recently added a donation button to our facebook page. You can also donate through our website. Volunteer: we couldn’t do what we do without our army of volunteers who come into schools and groups with us. Are you interested in volunteering? We’re looking for Christians who are interested in youth work. We don’t mind if you need some training! Get in touch about volunteering here. Prayer: We are a Christian organisation and we believe that prayer matters! Every term we release a calendar showing where the team will be teaching, so that you can follow along and pray for us and the schools. We would love it if you could join with us in prayer for reaching the youth of York. You can download our prayer calendar here. Feedback: We aim to do the best we can at all times. In order to do that, we need feedback and encouragement! If someone from YoYo has made a difference to you, your church or school, or if you’d like to give us a suggestion on something we could do differently, please let us know! We value the wisdom and knowledge of our supporters, and also, we do just love a good chat. Leave us some feedback here. We’d love you to join us for our AGM on Thursday 29th November at St Cuthberts House of Prayer on Peasholme Green. We’ll start at 4.30pm for a quick meeting, then move into worship and prayer. Click the picture below for the link to our facebook event! YoYo Internship applications now open! 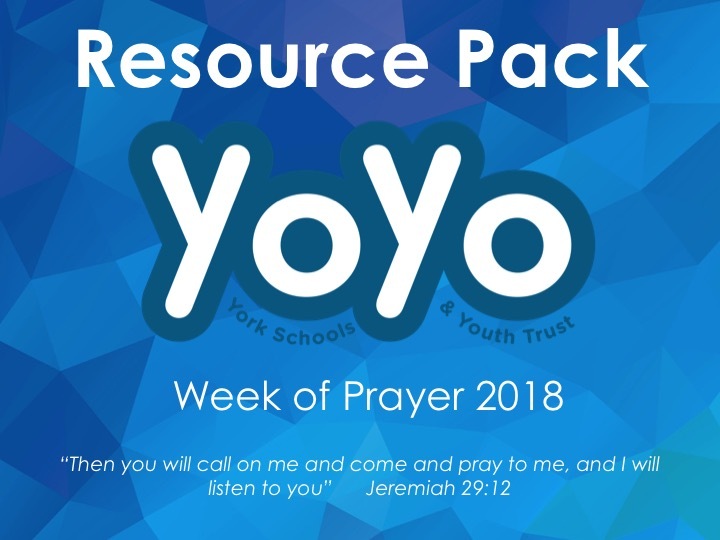 This week (30th April - 4th May) is our YoYo week of prayer. During the week we are asking and encouraging people to pray for YoYo and our upcoming work. We have put together a resource pack to help you pray. We have also put together a PowerPoint presentation. Feel free to download and use the pack and Powerpoint for your personal prayer, with friends, family, church or small groups. Click the images to download the resource pack and PowerPoint. The General Data Protection Regulation (GDPR) is a new EU law governing data protection, which will supersede the Data Protection Act in 2018. It is taking effect from May 2018. It aims to give people more control over their data and allows them to request to see the personal data held on them. York Schools and Youth Trust takes your privacy seriously. Click on the right to download our Privacy Notice which gives details about how York Schools and Youth Trust will use your personal data. We will be holding our next prayer meeting on Monday 22nd January 2017 from 4.30-6pm at St Cuthbert's House of Prayer, Peasholme Green, York YO1 7PW. Over a period of two weeks I worked in five primary schools reflecting on how faith helped soldiers fighting in the First World War. Sharing true stories of how the Bible had literally saved someone’s life, of how a prisoner of war set up a church service and helped bring comfort and peace to fellow inmates. 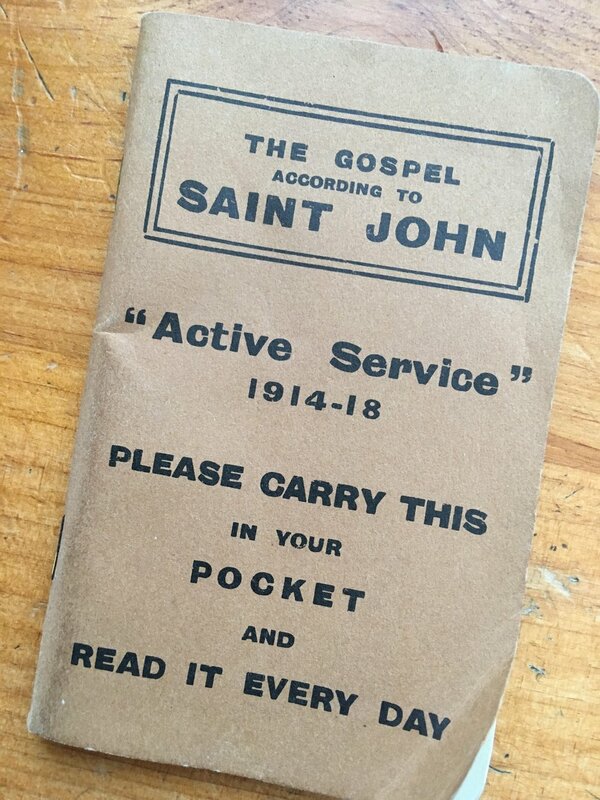 I showed a replica of the gospel of John that was handed out to the soldiers as they set off to those horror filled battlefields. I read a letter from a soldier who had received the gospel with derision but had later come to find courage through the Saviour. Powerful stories of how God’s word and God’s presence can transform hearts and minds. The children wrote some poignant and powerful pieces of poetry. This is a mere handful to show the depth of their understanding, the insight in their thinking and the beauty of their words. Don’t let fear take over you! 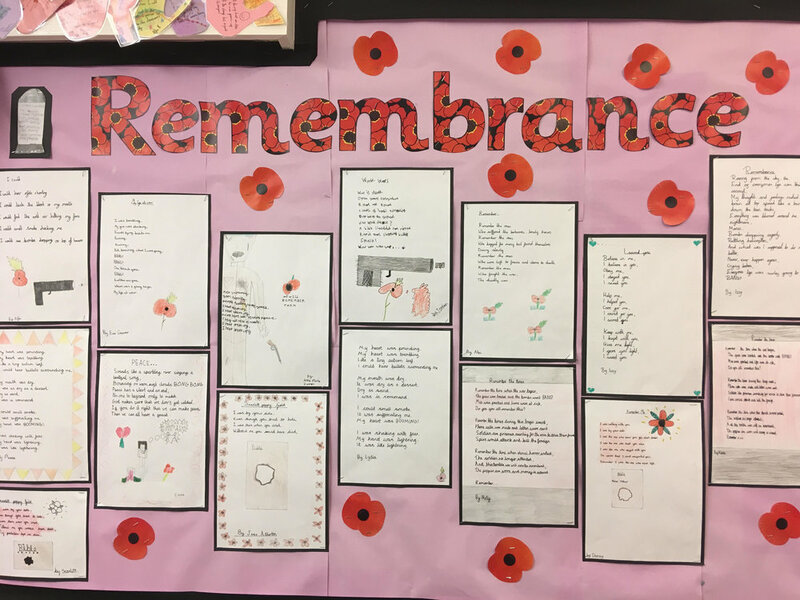 Beverley Pawson, Headteacher at Sand Hutton and Warthill Federation said "At Sand Hutton pupils shared their words with parents in a sharing assembly and at Warthill in a moving Remembrance Service where they were joined by veterans. Their contributions were both moving and insightful. We were very grateful for Tony’s input and special involvement." We are pleased to announce that our termly prayer meetings are re-starting on Monday 12th June from 4.30-6pm at St Cuthbert's House of Prayer, Peasholme Green, York YO1 7PW. All are welcome to join us to pray for the work of the team across the schools in our city and to pray for the less visible aspects of the work too such as trustees, admin, volunteers, finance. We will also meet again in September and will continue to meet each term after that. Do join us if you can. Please download and share this flier with your friends, church, small groups etc. We invite you to join us in our annual Week of Prayer Monday 8th - Friday 12th May 2017. Full details on the leaflets below - both of which can be downloaded for printing and sharing. Could you be a YoYo Trainee? We are looking to recruit some trainee schools workers from September 2017 to join our team for the academic year 2017-18, as we deliver lessons, clubs, assemblies etc to most schools around York. Our trainees would work alongside the experienced schools workers and can work flexibly and part time to fit around other commitments and all expenses would be paid. Previous trainees have made the role their own by utilising their skills and gifts to enhance the YoYo team's offering to schools. Before the February half term holiday, we were invited into Woodthorpe Primary to lead some lessons with year 5 on the topic of 'Is God Real?' The lessons were a great chance to help the children explore why Christians believe that God is real. We started the lesson by talking about why we believe that World War 2 happened, even though none of us were there. This drew out the point that it is possible to believe in something you may not have seen yourself because just like WW2, there is evidence for God's existence. We then used the lesson to talk about 3 main evidences for the existence of God: creation, Jesus and our personal experience. The children seemed to really enjoy the lessons and even the teachers commented that they had learnt a lot from them. Last week we had a fantastic week in All Saints Secondary School. We were asked to come in and work with the year 7 children, on the theme of 'being a modern day disciple'. Through the lesson we explored the idea of following and why you might choose to follow someone (including a higher or lower twitter quiz). We then explained why as Christians we choose to follow Jesus and his teachings. The main emphasis of the lesson was based around the great commission where Jesus tells his disciples that they have a job to do but he promises to be with them always. We encouraged the children that God will be with them always if they choose to follow him. The lesson was a great chance to share a bit about our experience, but also stimulate some deep discussion. We also had chance during the week to work with the whole of year 9 on the theme of 'Faith vs. Science'. Through the lesson we were able to unpack some of the misconceptions that people might hold about science and explain that science is really important and valuable, but it can not answer all of our questions in life - faith can answer some questions that science can't. The young people were able to see through the lesson how science and faith aren't necessarily in conflict with each other, but can in fact compliment each other and it is possible to believe in both science and faith. Working with youth and children, one of the most exciting things is seeing them becoming great leaders. There are teenagers across the city who are so excited about their faith that they want to share with their peers what they believe, and YoYo have a great opportunity to support them. Several Alpha groups have started in the city, with the youth setting them up and leading them in their schools so that their friends have the opportunity to ask questions and discuss what they think. It is great to be able to support young people in thinking about the big questions of faith, and to also team up with church youth workers in supporting these young leaders.